The Vikings and their funeral and burial rituals were wholly affected by their pagan religion and beliefs. For a Viking their death would lead them into an afterlife and into one of the Vikings nine realms. It was this belief that led the Viking to take so much time on their funerals and burials trying their hardest to send their friends, family or fallen comrades to a successful afterlife. The two realms in Norse mythology that were commonly associated with the religious practises of funerals and burials were Valhalla and Helheim. Valhalla was a place for fallen warriors and in opposite contrast, Helheim was for Viking people who had died from what was considered a dishonourable death. To die in bed of sloth, or to die of old age was not considered brave in old Norse times. In Viking times if you died, they would typically send you on your way in one of two ways, cremation or inhumation. A collection of Viking graves. There are typically two common ways to bury the dead, and the Vikings did practise both at some point. The first method, cremation is to burn the body at temperatures so hot that flesh and bone would turn to ash, the ash could then be scattered, buried or sailed out to sea. The second, inhumation was to bury the body in its current state under the ground, and then either place earth, dirt or stones on top of the body. The Vikings in the early years were almost entirely pagan in their beliefs and they would typically cremate their dead. Later as Christianity become more common it is believed the use of inhumation was more widely adopted. For the purpose of this article however we will focus primarily on the typical Viking practise, pre Christianity of cremating their dead. It was normal in Norse times to cremate the deceased body before a land or sea burial, a practise that had significant reach to their afterlife. By cremating their dead the Vikings believed the smoke would carry them to their rightful destination in the afterlife. Successful cremation in Viking times required a very hot fire, hot enough to burn flesh and bone to ash, and to achieve this a pyre was required. The Vikings created and used pyres to cremate their dead. Without the intense heat caused by a pyre, a normal fire would likely not burn the body completely. This could leave parts of the body remaining and is of course not desirable. Therefore the Viking uses pyre to ensure their dead were successfully cremated. A pyre is easily described as a large volume of wood, or a construction of wood that the body is laid upon. The construction of such pyres could take hours to build, necessary to ensure the heat was located in such a way that the body would burn effectively. When it comes to the burial, the Vikings would bury the ashes of their dead in graves or even under piles of rocks. Goods and belongings would be buried with the deceased, suitable to match their life. 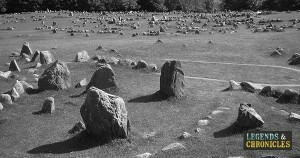 Viking graveyards were even common, with certain settlements and groups keeping all their dead in one location. There are even large stone ships structures in Scandinavia to allow the dead to sail even without a sea burial. 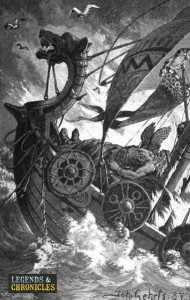 Another kind of burial was for the Vikings to sail their dead out to sea. The lore of this practise often involves the burning of the ship before the dead are cast out. However in practise its believed that this was not always the case, with many believing the body to be cremated before the ship was sailed. Either way it was common for the dead’s goods to travel with them out into the water. This type of burial was not common however, and was likely reserved for sea captains, noble Vikings and the very wealthy. In old Norse times boats would have taken months to construct and would not have been wasted without valid cause or a suitable amount of status. It was common for the Vikings to bury their dead with some of their goods or belongings. This was considered necessary for them to use in the afterlife, I mean what warrior would want to be without his trusty weapons, even if he were not to need them in the next life. A warrior could be buried with his shield or sword, and a craftsman might be buried with his tools. A Viking woman might find her cloth making equipment or cooking tools would follow her in the afterlife. In Norse mythology it is believed and alluded too in many texts that the afterlife you reached would depend on how you lived your life. The Vikings believed that the brave warriors who fell in battle would reap the most reward in the afterlife. This belief in many ways freed the Vikings to walk into battle with no fear and this would be the goal for many Viking in death. If you weren’t a warrior then of course you still had an opportunity for an afterlife as well. Valhalla was the hall situated in Asgard the realm of the gods, and Odin’s home. It’s often reported that Valhalla was a place for only warriors to go to, if you fell in battle as a brave warrior then entry to Valhalla would be granted to you. Folkvangr was another place brave warriors could live in the afterlife. Folkvangr was a field ruled over by the Goddess Freya, and was an alternative location for warriors. Freya would be able to choose half of the dead warriors from battle to come and live in the afterlife in Folkvangr. Helgafjell was known as the ‘holy mountain’, and was widely thought of as a rather nice place to live out the afterlife. Helgafjell was somewhere you could go if you did not die in battle, but you would have had to have lived what is considered a good life. Helheim was possibly the worst outcome for a Norse person in the afterlife. Helheim was cold and dark, ruled by the Goddess Hel, it was reserved for those Norse folk who died in a dishonourable way. This could be from laziness, old age, for example to die in your bed. In Viking times, dying in a brave way was definitely the most honourable. Funeral celebrations occurred in old Norse society, but the Vikings would wait for seven days before celebration. This day would be marked with the drinking of ale, which signified the passing of any property from the deceased. After this celebration the heir would truly claim their inheritance.